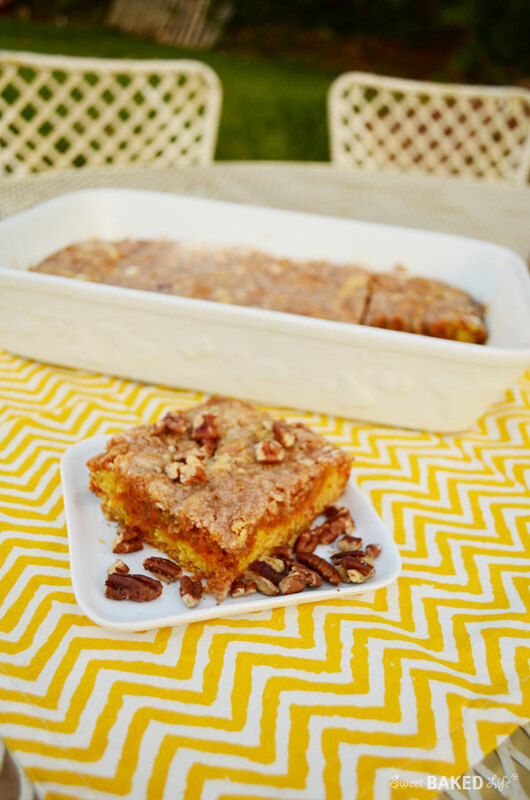 With the cool weather upon us and Thanksgiving just around the corner, it’s time to warm up your home and your tummy with a batch of these Pumpkin Butter Dessert Bars! You see, a couple of years ago my son and I were wondering through our local mall, when all of a sudden our senses were filled with the most incredible aroma! We discovered it was coming from the Williams Sonoma store. Of course we had to stop in to see what was baking! Fresh out of their oven we were given a sample of the most delicious pumpkin bars ever! 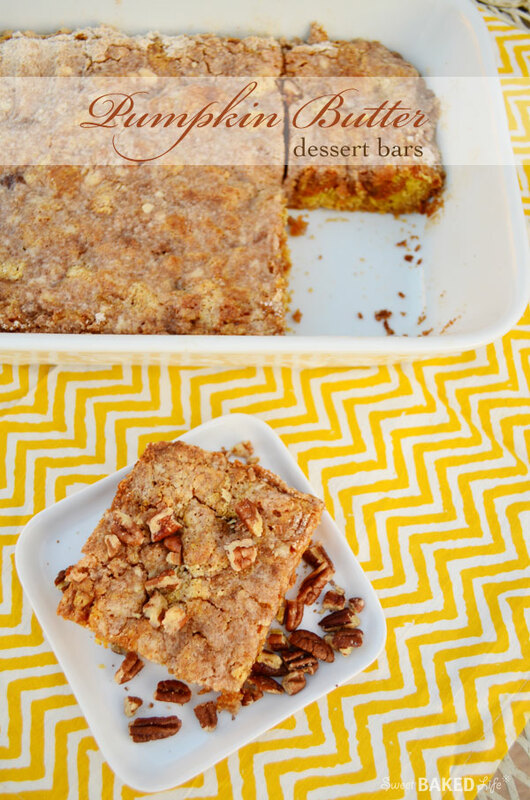 We instantly fell in love with these bars and I quickly purchased a jar of the pumpkin pecan butter they used; and just our luck, we were given a copy of the recipe with our purchase! Since then, I have made these Pumpkin Butter Dessert Bars numerous times during the fall and winter months, tweaking the recipe slightly when I can’t find that special pumpkin pecan butter or eliminating the nuts for those who do not like them. This time I used pumpkin butter that I found at my local Trader Joe’s and after I baked the bars, I sprinkled the top with chopped pecans for those who love the added crunch. These turned out delish — a winner in my book! Preheat oven to 350° F. Prepare a 9×13-inch pan with cooking spray and set aside. Divide yellow cake mix, placing all but one cup in a mixing bowl. Stir the melted butter and one egg into the cake mix. Press the mixture into the bottom of the prepared pan. In a medium bowl, mix the jar of Pumpkin Butter with the two eggs and whisk until combined. Pour this mixture over the cake mix. Stir the reserved cup of cake mix with the flour, sugar, softened butter and cinnamon in a small bowl. Mix together until crumbly. Sprinkle over top of the pumpkin layer. Bake for 40 to 45 minutes or until golden brown. Cool slightly. Cut into 2-inch squares and sprinkle the tops with chopped pecans. 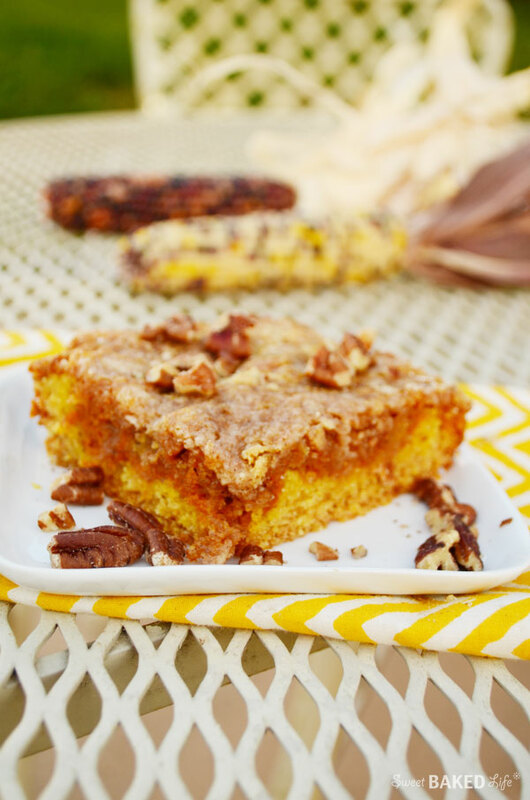 Warm and yummy — you won’t be able to resist these Pumpkin Butter Dessert Bars! They’re perfect to serve at a family gathering or just as a great breakfast, snack or dessert! Next postI’m Thankful for You! We don’t have Trader Joe’s in this area. How much pumpkin butter would you use if you make your own? Hello Mac — sorry about that, I used a 10 oz. jar. I have changed my recipe to reflect the change! I hope you get to make these are they really are so good! How could we make this without using a cake mix? I have never made this without the cake mix, but here is a recipe I found for homemade cake mix that you could try: http://www.melskitchencafe.com/homemade-yellow-cake-mix/. Good luck! When pumpkin butter is out of season, I substituted cookie butter in place. The result was another level of food bliss.